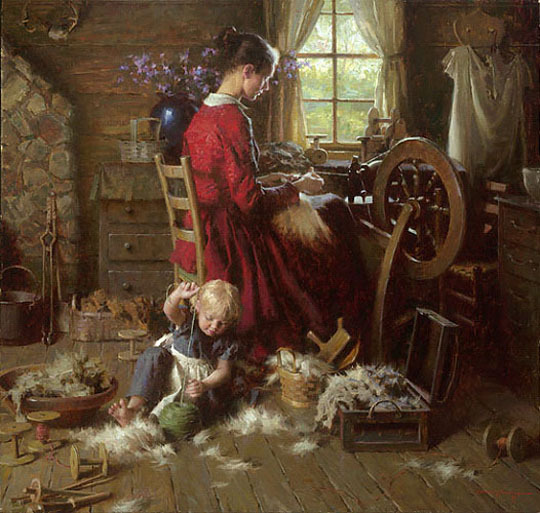 I learned a lot about spinning wheels while painting this piece and how different threads and yarns were spun from fleece a century ago by pioneer women. It is a very quiet, serene and meditative art form that I witnessed as my model worked in my studio for hours as I painted. This is also the perfect backdrop for a two year old to wreak havoc and I am experiencing this part first hand in my studio every day with our child. One can imagine this mother’s reaction when she soon turns to see why her girl is being so quiet!